Holi is around the corner, and we all know that there is more to this vibrant festival than colours! From a change in season, to getting together with family, and preparing delectable sweets and snacks, this festival has many dimensions to it. As winter bids adieu and summer begins to make its presence felt, this festival does its bit by warming our hearts and energizing our souls in preparation for the fun that lies ahead. Add more cheer to this feisty occasion by preparing a vast spread of sweets to enjoy with your family and share with your friends. This article gives you a set of recipes, both traditional and innovative, which not only match the festive spirit but also the weather at this time of the year. 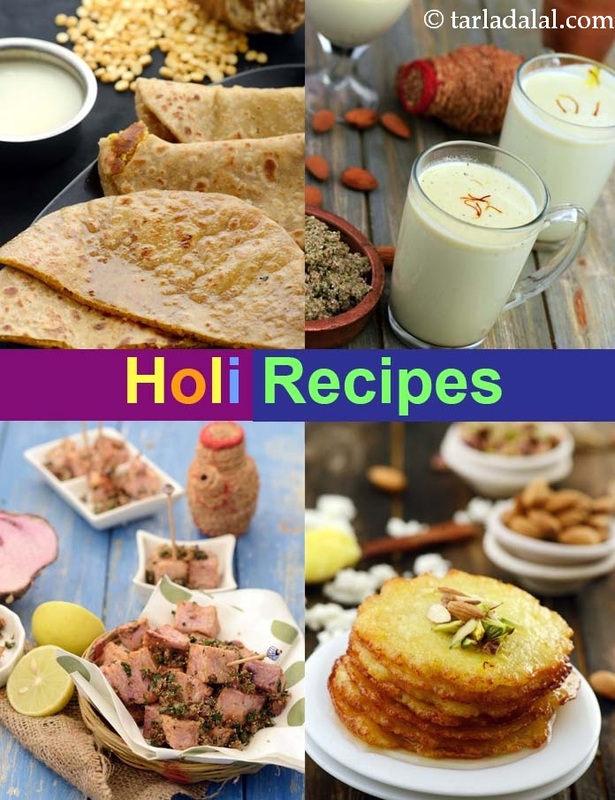 Whether you like to have your Thandai the traditional way or as an innovative mousse, whether you wish to relish a traditional Kulfi or a refreshing smoothie, take your pick from this collection of mouth-watering recipes, and make this Holi all the more special. Thandai : This fresh, homemade Thandai tastes absolutely heavenly, far superior to the readymade mixes available in the market. Milk, energised with almonds and spices, Thandai is the perfect drink to serve on special days and festive occasions like Holi and Diwali. The aroma of fennel, cardamom, pepper and saffron rise atop the dense flavour of fully boiled milk, to pamper the senses and rejuvenate the spirit. You can strain the mixture before serving if you want it smooth, but if you like the coarse mouth-feel of ground almonds and poppy seeds, you can enjoy the drink as it is without straining. Kesar Malai Kulfi: Cold though it is, kulfi has a way of warming your heart, perhaps due to the spicy overtones of saffron and cardamom or the intense richness of freshly condensed milk. Kesar Malai Kulfi is one of the perfect desserts to serve at any gathering because it is unconditionally loved across generations! Malpua : Hot Malpuas are irresistible, whether had plain or with a topping of cold rabdi. Try making this delightful treat at home itself, this time with a slight twist. In this version, we have avoided deep-frying the malpuas and cooked them with minimal ghee in a frying pan. They turn out as soft as ever. Thandai Smoothie: The Thandai Smoothie is a fruit-less smoothie with a rich and festive feel. It is made by combining ice-cream and curds with a dash of traditional Thandai syrup. This creamy smoothie has strong spicy notes, which makes it more popular amongst adults than kids. Thandai Mousse : Here is a mousse with a desi dimension to it! Thandai Mousse would be appropriate for occasions like Holi and other Indian festivals or get-togethers. Rich ingredients like almonds, khus-khus and cardamom that are present in the Thandai syrup give a slightly spicy touch to this mousse. This recipe uses readymade Thandai syrup, but in Rajasthan, the spices are ground freshly using a mortar and pestle every time Thandai is made. Malai Kulfi : Being a frozen dairy dessert, kulfi is technically an ice-cream, but with the rich flavour and unique texture of condensed milk, it is a class apart, a genre in its own right! Of the many varieties of kulfi, this traditional Malai Kulfi stands out with an extra rich and intense flavour and creaminess, all thanks to the slow but rewarding process of condensing full-fat milk till it gets an irresistible texture and aroma. A sprinkling of cardamom accentuates the appeal of this dessert. Chenna Malpua : Delicate and lacy malpuas made using fresh paneer which will melt in your mouth. This recipe is somewhat comparable to the famous malai malpuas of Pushkar near Ajmer. Serve them warm topped with raabdi or just garnished with chopped almonds and pistachios. You will find chenna malpuas only at a few cities in Rajasthan. Just grab the opportunity to make them as they are simply divine! These malpuas are a little tricky to make, so be patient. Sometime, they can just disintegrate in the ghee while frying. If that happens, add some more cornflour to bind the dough. This recipe is ambrosia for all sweet lovers, especially those fond of sheera . This recipe is divine. It is coarse and sweet. It generally takes a long time to cook, but this recipe is made in just 20 minutes.